Announcing two free local skeptical events! Mary Roach will be receiving the “Annual Outstanding Lifetime Achievement Award in Cultural Humanism” from the Harvard Secular Society and the American Humanist Association on Wednesday, April 25 at the Harvard Science Center. Mary is the reigning record-holder as 3-time Boston Skeptics Book Club author (Spook, Packing for Mars and Stiff.) Maybe I can get her to autograph my Kindle? Tickets (free) and details are available from the Harvard Humanist Chaplaincy. On Saturday, May 12, the Cape Ann Skeptics will be sponsoring Skepticamp Cape Ann in Gloucester. This one day, free event will be from 9:30 until 4:00 in LaTrattoria, a downtown Gloucester restaurant. See their web site for full details. A few of us ventured into the wilds of New Hampshire for the Granite State Skepticamp last October, and had a great time. Gloucester is closer and has many fewer bears, so I highly recommend it. Wednesday, March 14 is Pi Approximation Day. Join us for our annual pie fight on Cambridge Common (one block north of Harvard Square) on Wednesday, March 14 at 7 PM. Bring a pie and scuzzy clothes. The weather forecast is for clear with a high of 56, so be prepared for freezing drizzle or heat and humidity. Update: Bad Geometry! I forgot to multiply by the depth of the pie. Also, the Greek letter lowercase pi looks really awful in the default font. Sort of like a poorly drawn lowercase “n”. I said math is a dirty business; there’s your proof. Maggie Koerth-Baker recently wrote “The trouble with making these kind of decisions, though, is that there’s lots of room for reasonable people to disagree.” She sounds like a reasonable person, so let’s all gang up on her! Her talk will tell the story of our electric infrastructure–where it came from, how it works today, and how it will have to change to meet the needs of a new generation. Several of the back-cover reviews are by people who should be very familiar to members of the Boston Skeptics Book Club. 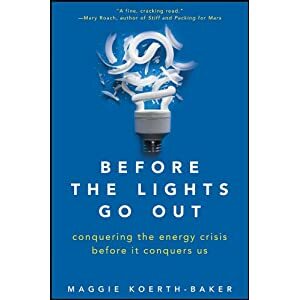 Mary Roach (Stiff, Spook and Packing for Mars) called it, “a fine, cracking read.” Carl Zimmer (Parasite Rex) says, “Maggie Koerth-Baker is one of the most innovative science writers at work today. Rather than settling for cheap flash, she burrows deep into many of the biggest mysteries in science and technology and comes out with wonderfully clear explanations”. Many of the subjects that skeptics deal with, like ghosts, UFOs, Bigfoot and ESP, are amusing examples of fallacious reasoning and illuminate interesting flaws in perception and the human brain, but, except in the cases of rare individuals, have no important effect on most people’s lives. But a few subjects, such as energy generation, storage and distribution, are areas where science and technology meet society in profound and important ways. I would class it with alternative medicine and religious fundamentalism and their interference with science (particularly in their denial of biology and evolution) and AGW denialism as important topics for applying critical thinking. When discussing these topics, it is essential to start with a firm factual basis, which is what Ms Koerth-Baker’s book promises to provide. Please come hear this important talk. Maggie Koerth-Baker is both a freelancer and the science editor at BoingBoing.net, one of the most widely read blogs in the U.S. Her work has appeared in print publications like Discover, Popular Science, and New Scientist, and online at websites like Scientific American and National Geographic News. We will be meeting a week later than usual, on April 2, at 7 PM at Tommy Doyle’s in Harvard Square. RSVP on our Facebook event page. Meanwhile, if this subject is too depressing (it shouldn’t be, since we can and will eventually solve it, the only questions being at what cost and who pays), look at the lizards!